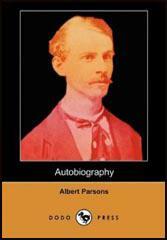 Albert Richard Parsons was born in Montgomery, Alabama, on 24th June, 1848. Orphaned at five years old, he was raised by Esther, an African American slave. In the Civil War he served as a member of the Confederate Army under the commanded by his brother, Major General William Parsons. After the war Parsons condemned slavery and became a Radical Republican. Now a socialist, Parsons began publishing the Spectator, a journal that advocated equal rights for African-Americans. In 1873 Parsons married Lucy Waller, the daughter of a Creek Indian and a Mexican woman. Mixed marriages in Texas was unacceptable and so under pressure from the Ku Klux Klan, the couple moved to Chicago. Parsons became a printer but after becoming involved in trade union activities he was blacklisted. Parsons and his wife joined the Socialist Labor Party in 1876. They were also founder members of the International Working Men's Association (the First International), a labor organization that supported racial and sexual equality. Parson also became editor of the radical journal, Alarm. The campaign for the eight-hour day was organised by the International Working Peoples Association (IWPA). On 3rd May, the IWPA in Chicago held a rally outside the McCormick Harvester Works, where 1,400 workers were on strike. They were joined by 6,000 lumber-shovers, who had also withdrawn their labour. While August Spies, one of the leaders of the IWPA was making a speech, the police arrived and opened-fire on the crowd, killing four of the workers. On 4th May, over 3,000 people turned up at the Haymarket meeting. Speeches were made by Parsons, August Spies and Samuel Fielden. At 10 a.m. Captain John Bonfield and 180 policemen arrived on the scene. Bonfield was telling the crowd to "disperse immediately and peacebly" when someone threw a bomb into the police ranks from one of the alleys that led into the square. It exploded killing eight men and wounding sixty-seven others. The police then immediately attacked the crowd. A number of people were killed (the exact number was never disclosed) and over 200 were badly injured. Several people identified Rudolph Schnaubelt as the man who threw the bomb. He was arrested but was later released without charge. It was later claimed that Schnaubelt was an agent provocateur in the pay of the authorities. After the release of Schnaubelt, the police arrested Samuel Fielden, an Englishman, and six German immigrants, George Engel, August Spies, Adolph Fisher, Louis Lingg, Oscar Neebe, and Michael Schwab. The police also sought Parsons but he went into hiding and was able to avoid capture. However, on the morning of the trial, Parsons arrived in court to standby his comrades. At the trial it emerged that Andrew Johnson, a detective from the Pinkerton Agency, had infiltrated the group and had been collecting evidence about the men. Johnson claimed that at anarchist meetings these men had talked about using violence. Reporters who had also attended International Working Men's Association meetings also testified that the defendants had talked about using force to "overthrow the system". All the men were found guilty: Parsons, August Spies, Adolph Fisher, Louis Lingg and George Engel were given the death penalty. Whereas Oscar Neebe, Samuel Fielden and Michael Schwab were sentenced to life imprisonment. On 10th November, 1887, Lingg committed suicide by exploding a dynamite cap in his mouth. The following day Parsons, Spies, Fisher and Engel mounted the gallows. As the noose was placed around his neck, Spies shouted out: "There will be a time when our silence will be more powerful than the voices you strangle today." My brother, Major General W. Parsons was in command of the entire cavalry outposts on the west bank of the Mississippi River from Helena to the mouth of the Red River. I was a mere boy of 15 when I joined my brother's command at the front on White River, and was afterward a member of the renowned McInoly scouts under General Parsons' orders, which participated in all the battles of the Curtis, Canby and Banks campaign.